This summer, the Hop offers THREE HIP HOP EVENTS reflecting a dizzying new age of cultural interchange, from urban America to India, England, France, and beyond. 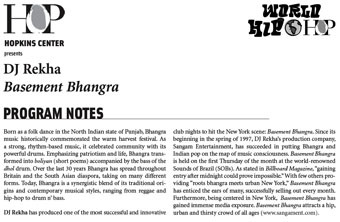 Born as a folk dance in the North Indian state of Punjab, Bhangra music historically commemorated the warm harvest festival. As a strong, rhythm-based music, it celebrated community with its powerful drums. Emphasizing patriotism and life, Bhangra transformed into boliyan (short poems) accompanied by the bass of the dhol drum. Over the last 30 years Bhangra has spread throughout Britain and the South Asian diaspora, taking on many different forms. 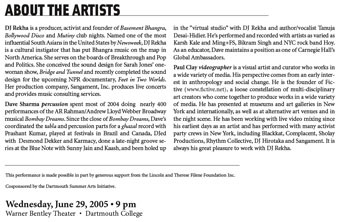 Today, Bhangra is a synergistic blend of its traditional origins and contemporary musical styles, ranging from reggae and hip-hop to drum n' bass.